The inspiration for my dice tower. Several years ago, I ordered an inexpensive item for about $6 from Boulder Games . This dice tower from German maker Kuhlmann GeschichtsSpiele proves to be a useful and fun purchase. It is shown in the picture at right. 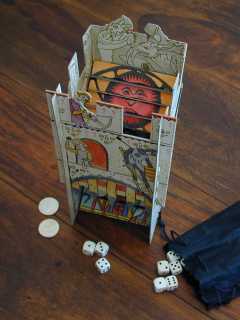 It is made of cardboard with a two-sided printing reminiscent of the Bayeux Tapestry with bowmen, horse-riders, knights, and the inhabitants of the tower. Even the ramps have images that are reminiscent of colored stained-glass windows. There are 3 ramps each with ribs to help randomize the fall of the dice. The tower is 8.25" (21 cm) high by 3.5" (9 cm) by 4" (10 cm) deep and is shown with U.S. quarters and 13mm dice for size comparison. All in all, it is a useful device for randomizing a dice roll and keeping the scattered dice from knocking over all the pieces on the game board. 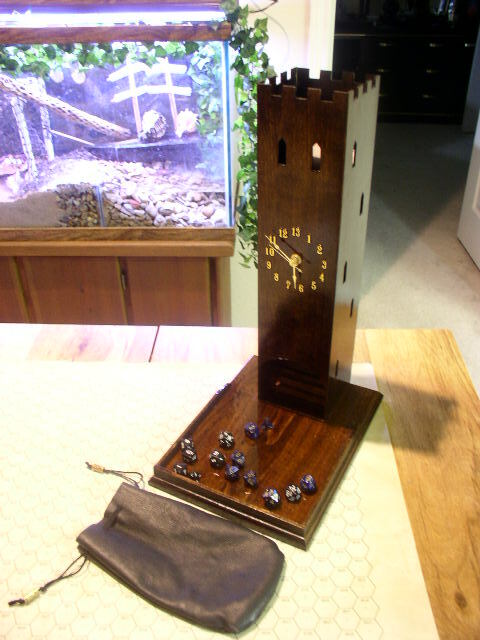 Inspired, I decided to construct my own dice tower. I chose the material basswood, which is available in many hobby shops, is easy to cut, and in between balsa and pine wood in durability and hardness. I did not make paper plans, but I had an idea of the size and shape. Basically I wanted to make a 4 ramp tower, of about the same footprint as the Kuhlmann GeschichtsSpiele tower, but taller. My tower, shown in the picture at left, is exactly 1' (30.5 cm) high, because the basswood comes in 3' lengths and that would make good use of the stock length of the wood. The footprint is approximately 4" x 4" (10 cm) because that also is the stock width of the wood as it comes from the hobby shop. Basswood is a good material for all kinds of hobbies and projects. The wood is cut easily with an X-Acto saw or knife. Earlier in the year I built a working 1/12th scale trebuchet that a actually hurls a projectile. See the trebuchet page to get a description of this destructive project. It's for people who love to hurl. In this picture at left we see the windows that I have cut into the sides. Not only do the windows make the tower look more three dimensional, they also allow the sound of the falling dice to escape, somewhat like the holes in a acoustic guitar or violin help amplify the sounds within. 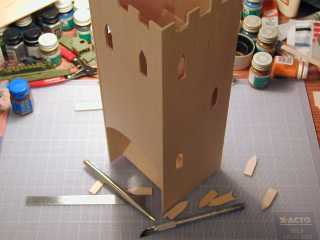 Together with the nice hollow knock of the basswood, this tower make an excellent sound as the dice fall. The more dice the better the clatter! Also notice the staggered top wall of the tower. This is completely unnecessary to the function of the tower, but it adds a bit of realism. When the tower was disassembled, I clamped all four side together and cut the pattern on the top part of the wood with the X-Acto saw. The wood splintered a bit so next time I am considering an alternate method to cut these dragon's teeth in the walls. Perhaps a small walkway and some HO scale figures would be cool too. 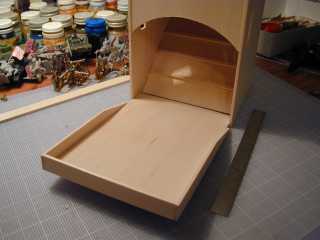 A look at the draw-bridge, ramp, and ribbing. 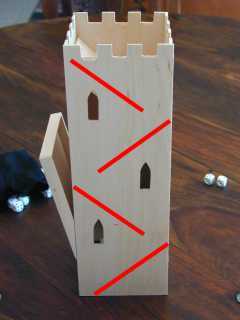 One unexpected consequence of the additional height for the tower is the added velocity of the dice as they exit the tower. My taller tower throws the dice farther across the table than the Kuhlmann tower. To help contain this mayhem, I built a folding draw-bridge to catch the dice. 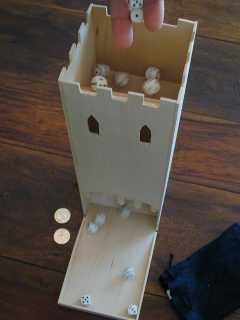 This draw-bridge is friction fitted to the mouth of the tower, and it has 1/2" (13 mm) side rails to contain the escaping dice. Of course an occasional die escapes, but in general the bridge works nicely. The tower can be used without the bridge or with the bridge in a slightly elevated position as shown at the right. This picture also shows my messy hobby table. In the background are some Battle Cry figures waiting to be painted, a topic for some future article. I wish my house had a basement like my friend's houses in New Jersey have. Those guys have all sorts of wonderful projects going on: gaming, modelling, beer brewing, exercise areas. You would think central Texas with the proximity to tornado alley would have basements, but unfortunately I leave this mess in a spare room. As is my personality, I have 50 projects proceeding in parallel at my desk. But I digress. A side view with positions of ramps indicated. The picture at the right shows the dice tower marked with the approximate positions of the ramps. The top 3 ramps are 3" (7.5 cm) long and situated at about 45 degree angles from horizontal. There is about a 1" wide gap that the dice fall through on their way to the next ramp. Each ramp has several ribs made from 1/8" (3mm) square stock. This is a bit too thick than what is needed, as the smallest 3mm dice sometimes get stuck in the tower. On the next tower I will use 1/16" lumber which I am sure will still be adequate to tumble the larger dice on their way down the tower. Also notice the ramps are all situated front-to-back. I doubt anyone could try to cheat with this tower, but for additional randomization, it would have been better to situate the middle two ramps side-to-side. This would have tossed the dice sideways as well as back and forth on the way down. Perhaps this would foil an unscrupulous roller who places the 1 and 6 pips left and right to avoid rolling those numbers. The windows are carefully situated to avoid seeing the ramps and give the impression that it is a true tower. However, notice the top left window shows the top ramp a little bit. My mistake. Next time I will have to plan more carefully. Extremely useful if you ever have to roll 85 D6. Finally at right we see the tower in action! It is very easy to dump 20 or 30 dice in the top and catch them all at the bottom. The tower works well with small dice down to about 4mm, all the way up to the large behemoth dice used in Battle Cry which I believe are 3/4" (2 cm). Due to the proximity of the ramps to the tower side wall, I imagine these are the largest this tower can handle. It is tough to see, but I also created a spiked gate at the mouth of the tower. This is a nice detail to add, and it was made from 3/8" (1cm) wide wood stock. What about painting or other decoration? I considered painting with acrylics, but I ran out of enthusiasm toward the end of the project. Another alternative is to decorate with water color art markers such as Berol's Prismacolor markers. Since these markers are water based, it would be good to coat the tower with polyeurathane after decorating, to prevent colors from running and to prevent finger oils from being absorbed into the wood. Another idea would be to print scenes from the Bayeux Tapestry with a computer printer, cut out the scenes, and paste them to the tower. I opted to leave my tower unpainted. I didn't want to have a craft that no one would use, rather I wanted to have a good functional tool that would be used often. Already I am dreaming plans for the next tower which I imagine will be cylindrical with a helical ramp within. If you have comments, or want to share gaming projects that you have done, I would be happy to hear about your works. I received a nice email on this article from JR Hendricks, an engineering student at Texas Tech University in Lubbock, Texas. He read some of the articles here and came up with his own design for a dice tower. First of all, notice the nice finish on this tower. Definitely heirloom quality, something to pass on to the kids. However, for me the best feature is the 13 hour clock. Also notice the similarity to the original. Nice crenellations at the top and nice staggered windows that hint at the ramps inside. In all there are 6 ramps, and the tower stands 19 inches when on its base. Simple a great project that some one has suggested be named the "Glockenturm des dunklin Holzes" (Clocktower of Darkwood). Last modified: Thursday, 09-Jun-2011 12:35:33 MST.